Find out all the costs related to elevator installation. In our elevator installation cost guide we included everything you must know before installing one. As we age life becomes more sedentary, locomotion reduces, and simple things like climbing the stairs become more challenging. Many people prefer to age in place and therefore need to make their home environment more responsive to their needs. One of the major challenges is moving between floors, and the best way to overcome the challenge is to install an elevator. A home may have a physically disabled person who needs to move between floors as well. In most homes, the family members’ bedrooms and studies are located in the upper floor. The basement is usually designed for family entertainment including the home theatre, gym, bar, and playroom, and for functional utilities like the HVAC, water treatment, electrical control, and cold storage. The family members need to access these places irrespective of their abilities and one of the best solutions is to install a residential elevator. According to ImproveNet.com, the elevator is a major investment that starts at $15,000 and can easily surpass $50,000 (see our article on remodeling for disability). And according to Residential Elevators, Inc., besides the cost of buying the elevator itself, the other major costs are labor at $5,000 to $23,000 the construction of a shaft or hoistway at $2,000 to $4,500, the landing or approach at about $1,800, and the cost of finishing at $1,500 to $4,500. In total it would extras would add between $5,000 and $15,000 to the total cost. The major parts of elevator installation are the machinery, labor, finishing, and accessorizing. The elevator’s electrical work is complicated by the fact that some wiring and fixtures are internal and move with the car, while others are external to the elevator and fixed on several floors. As a luxury item, the elevator uses high-grade materials and décor. There are numerous manufacturers of residential elevators. The one you choose should ultimately be based on how well their particular elevators will meet your needs. When installing the elevator in a new construction, you will incorporate the elevator in the overall design and apply the UD concept. It will be easier and cheaper to build the hoistway and to install a cable driven elevator because you will incorporate its MR in the design. Although Prosper, Inc. puts the cost at between $5,000 and $12,000 for installation, some elevator installers state that their customers spent on average $25,000 to $35,000 for the cab unit alone and a further $30,000 for plans, hoistway construction, footprint, electrical, and carpentry work (Prosper.com). Fixr.com puts the average cost at $20,000, and the range at between $10,000 for a basic pneumatic system and $50,000 for a custom hydraulic elevator. The cost of installing the elevator is around $10,000. A significant cost that is not advertised by the elevator company is the building of the shaft or hoistway and machine room, which can range between $7,000 for a new construction and $15,000 for a retrofitting (Stiltz.com). This cost is brought about by the difficulty of working in a confined environment with a built-up structure (the house). It takes between 5 and 12 days to build the hoistway, although the task would be easier, faster, and cheaper if the original house design had envisioned a future with an elevator and planned the footprint and alignment of the shaft footprint and hallways. It is cheaper to install a cable driven than a hydraulic driven elevator during a new construction, but more difficult and expensive to retrofit. A two-door elevator would accommodate differences in the landings, but it would cost an extra $750 or so to install. A comparison is made between standard and optional features than make costs so different. According to the National Association of Home Builders, the nation is aging and demand for elevators installation has been growing at 12 percent in 2016 compared to 8 percent in 2004. Elevator installation is a highly technical and precision engineering activity, and so, needless to say, elevator installation is not a DIY project by any stretch of imagination. All installation companies are either appointed or approved individually by the manufacture, but in many cases the company does the installation themselves. Even the finishing part is done by a specialist carpenter and a specialist electrician for elevator finishing, accessories and décor. The prudent home owner will have planned for the elevator installation during the house design phase. Moreover, elevator installation as a retrofit costs significantly more than if it was installed with the original construction. The elevator is a functional addition to the house, is aesthetic, and enhances the house’s ROI. It is a luxury that cost between $25,000 and $50,000 on the total budget, but at the end of the day it improves the comfort of living in the house. While on a shoestring budget, you can choose between a standard elevator with basic features and a sophisticated drive mechanism, or a well-trimmed elevator with a simple drive mechanism. The elevator is part of UD that also improves the transportation of the disabled, aged, young children, heavy furniture, luggage, and laundry. 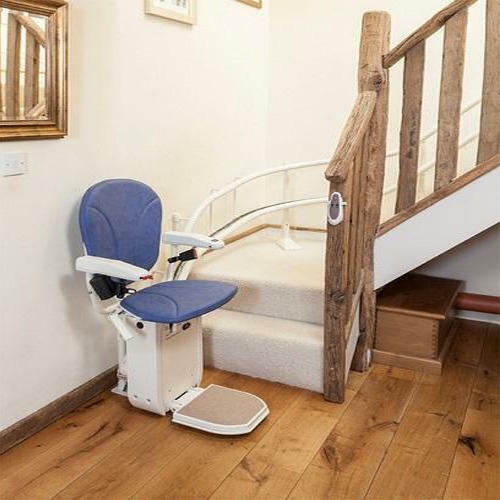 It looks more stylish and practical than a stair lift, which is intrusive and only adapted for disability (see our article on Remodeling for Disability Cost Guide). Since accidents and illnesses can occur any time and cause disability, it is good to be prepared early by having an aid such as the elevator. In order to make the home more livable in future as one ages in place, it is a good investment to have an elevator in place. An elevator offers an alternative means of reaching other floors, especially if you are moving the basement to the uppermost floor. Finally, the longer you own an elevator, the lower the cost of ownership, as the lift can last many years in serviceable condition. The choice of elevator should be informed by several factors. Price is uppermost as the elevator is not easily affordable. The pneumatic elevator is the most affordable at $15,000 to $20,000 to buy and install, but the hydraulic is the most expensive at $35,000 to $50,000. Your property tax will increase upon installation, as will the inspection and maintenance fee, and your electricity bill. It costs about $75 for inspection, $350 for annual maintenance, and an extra $30 to $50 on the electricity bill. The elevator should be easy and quick to install once the hoistway has been built. Some companies like Stiltz can install an elevator in just two or three days, while the carpenter and electrician will take another three days to do the finishing. As noted already, labor costs will range between $5,000 and $15,000 for installation and $500 to $2,000 for finishing and décor work. The footprint of the elevator is quite small, not more than 18 square feet on each floor. Moreover, the elevator is self-supporting within the hoistway. In order to maintain design and style, the elevator panel and finishes are made of similar materials to the houses, and the elevator can be even camouflaged in the floor design. The elevator is built with safety as a paramount concern (Stiltz.com). You need to consult with an elevator expert and a home designer for the best options. Many American families, according to Residential Elevators, are opting to for aging in place and using the UD concept, where the home is accommodative to the various types of occupants, namely; the abled, disabled, young, and old persons. Persons with disabilities need an easy way to reach the upper floors or basement of the house by means other than climbing the stairs. The available options include either the lift or the elevator, and the elevator is the preferred choice where budget allows, and it is more prudent to invest in an elevator system which is a UD compliant system that meets the needs of all users to easily move between floors. On the one hand, a staircase lift is cheaper to install and fit into an existing house design, since it costs about $5,000 (see our article on Remodeling for disabilities). It takes a day or two to install, and since it comes in kits, it can be installed by an independent technician. As long as the staircase is wide enough to accommodate the chair the lift will not require extra footprint and it can be folded when not in use. The lift has a low risk of accidents as it slides on a smooth and gentle incline. However, it is generally designed to accommodate just one disabled person and minimal luggage, and you need a specialized wheelchair lift if the person is wheelchair-bound. According to houzz.com, the chair lift does not improve the ROI of the house. On the other hand, the elevator meets the universal design requirements and it can transport both the disabled and the abled persons alike and together, is easier to operate through the COP, can elevate between two and eight persons at a time, can be used by a wheelchair-bound user, a disabled person who is able to stand on their feet or with the aid of a walker, or even a bed in some cases. Moreover, it can easily operate on multiple floors from the basement to the uppermost floor. In fact some luxury homes have an elevator to the rooftop. The elevator requires a small footprint on each floor. Because of a high risk in the event of an accident, the elevator is built and installed with the highest levels of safety and standards of workmanship compared to the lift. On the downside, the elevator is expensive with a minimum investment of about $20,000, lacks an easy escape in the event of a serious malfunction, such as a broken hoist cable. It can only be maintained or repaired by the manufacturer or their approved installing company or engineer, which raises the maintenance cost significantly. The elevator gives a good ROI in the range of 50 percent, give or take a few points. One reason for the high residential elevator installation cost is because it is a highly professional and sensitive project that charges premium fees for labor. For example, Fixr.com notes that a manufacturer charges around $4,500 for labor that excludes finishing for a two-stop installation, and independent contractor charges much higher, from $10,000 and more. Furthermore, the architect and interior designer charge a minimum of $750 to redraw the floor plan. 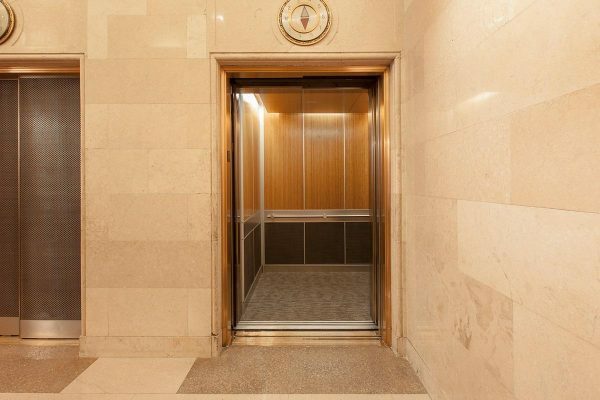 An elevator carpenter and electrician will charge a further $800 to $2,000. Building a hoistway is another cost center. The hoistway involves knocking down some walls and floor, digging a pit, concrete filling, building new walls, and creating elevator entryways. Retrofitting is expensive because you have to work within a confined and already build up structure. You have to find a wide enough entryway for the elevator unit or knock down the house’s entryway. Another reason for the high cost of retrofitting the elevator is that in some instances you have to either knock down the elevator unit or demolish the doorway or a section of the wall in order to move the elevator into the house. The elevator is at least 42” wide while most doorways are between 32” and 36”. Design features and fixtures add significantly to the cost, especially the drive system, entrance design, cab panel finishing, COP and hallway station type, load capacity, number of floors, and overall finishing and décor. 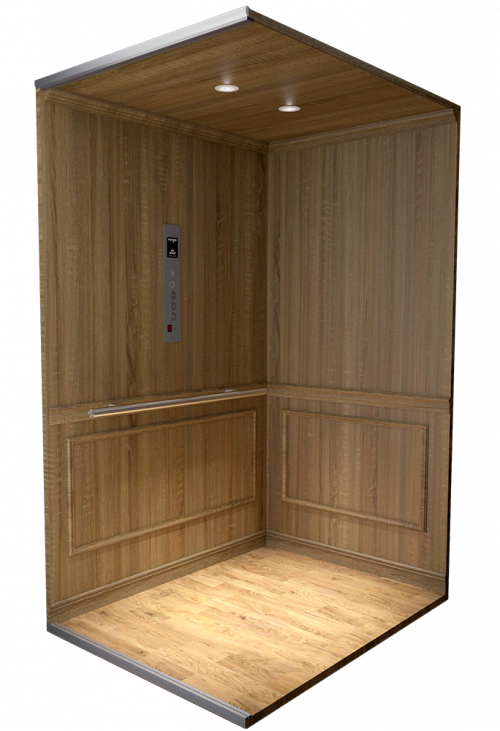 The average cost of installing an elevator is well above $15,000 and can be as high as $55,000 (ImproveNet.com). Labor alone costs between $4,000 and $12,000 by manufacturer, and $7,000 to $15,000 by an independent contractor. Professional charges would be $1,200 for the architect, $600 for the carpenter, $1,200 for the electrician, $2,000 for the engineer or technician, and $500 for the painter/carpet setter (ImproveNet.com). 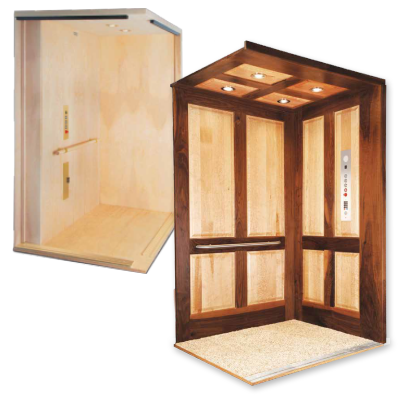 The Elevette® residential elevator cabs come in five standard and custom styles and designs. The 500 Cab is an elegant acrylic panel on a powder-coated aluminum frame. The 400 Cab is a solid wood or hardwood veneer with recessed center panels. The 300 Cab is a smooth hardwood veneer and baseboard molding. The 200 Cab has smooth hardwood veneer with flush corner and the 100 Cab has a simple style with flush corners and paintable walls. The cab style comes with cost implications. The drive system is compatible with all cab designs. The systems include the hydraulic, pneumatic, cable drum, and overhead MRL cable drum. The pneumatic system is the most affordable option, which is also energy-efficient, but it comes with the least functionality. The hydraulic system is the most expensive but also practical option for residential houses. The entrance system can have a one or two entrances. The landing gate will have one of the opening modes, namely; sliding, scissor, accordion, or swing. The cab door will have one of scissor, sliding, or accordion opening mode. You can add trimming, painting, veneer, or other finishing to the cab walls, ceiling, floorboard, and handrails. Choose the lighting and COP designs. The elevator is one of the four main types of vertical transportation system for people and goods between floors or decks, the other three being vertical chair lift, escalator, and the ramp. However the escalator and ramp are not for residential use. The elevator is a cabin that is ported between floors by a powerful drive system, which can be either an electric motor or a hydraulic pump. There are different hoist mechanisms of elevator drive systems for residential users, including; hydraulic, climbing, pneumatic, and traction mechanism. Elevators are fast becoming the in thing in house design. Essentially elevators come in three types based on the principal of operation, namely; pneumatic, hydraulic, and traction elevator. The traction elevator is basically designed for midrise and high rise commercial buildings, the hydraulic elevator for midrise and residential houses, and the pneumatic for residential and low-traffic, low rise buildings. 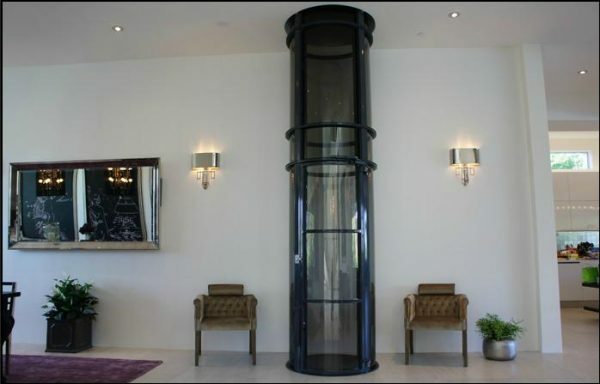 The pneumatic elevator is a modern concept that is especially suited to private residential houses. It can be installed in a condo and a boat as well! It is made with transparent glass, giving the user a full view. The unit is 37” slim, sleek, and compactly designed. It can rise to two or three floors, making it ideal for standard home with a basement, ground, and upper floor design. The elevator travels on a cushion of air below the cab which gives a smooth and safe ride. It is energy-efficient because it can run off the household supply and does not require power to descend. The tube is easy to install and relocate because of its simplicity, lightweight, and not requiring a hoistway to be built. The safety features include returning to the base during a blackout, and its braking is by air cushioning and brakes to assist. It can travel at 30 feet per minute or 10 seconds to clear a floor, which is fast enough for residential use. It does not require a MR or a basement pit. The cost of maintenance is minimal as there are minimal components and it does not require lubrication. The vacuum or pneumatic elevator is a new technology in which the principal of pressure gradient is used to generate lift. 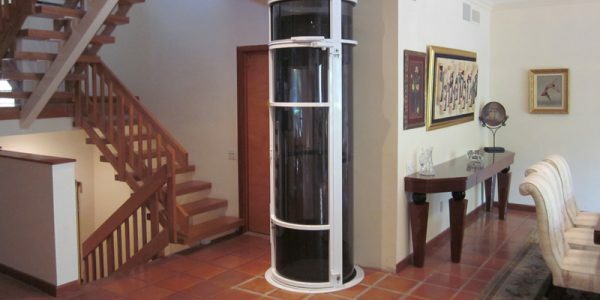 Thehoistway is a transparent glass tube, which is airtight when the door is closed. The cab is also transparent and airtight when the door is shut, and it floats on a cushion of high pressure. A suction pump creates a vacuum above the capsule while an air pressure pump creates high pressure below the cab, thus creating the lift. Lowering is achieved by a controlled release of the air. At the $10,000 system price tag and $5,000 installation cost, the vacuum elevator is the most affordable of the residential elevators. It is quick to install, about a day or two, does not require a MR or complicated base structures, looks slick, and it is smooth and quiet to operate. The system is safe because even when there is a power failure, the air pressure is released slowly and the capsule is cushioned by the air below it. However, it is slow at 20 feet to 30 feet per minute, has a low load capacity of just 250lbs to 450lbs or a single wheelchair bound user. It is minimalistic in features and creature comforts, and lacks privacy. The hydraulic elevator is a piston system that pushes the cab up on low- and mid- rise buildings. It moves at speeds of 30 to 200 feet per minute. The machine room is at the bottom of the elevator system. The holed hydraulic elevator is the more common design which has its piston retracted in a hole below the cab. The hole-less hydraulic elevator has pistons on either side of the cab and is placed at elevator pit level. For higher lifting levels of up to 60 feet, for example when you want your lift to reach the rooftop, you can use a telescopic piston system. The non-telescopic piston can reach has only one piston and it can raise the cab up to 20 feet or three floors up. The roped hydraulic elevator uses a cable and telescopic hydraulic combination to increase the travel distance to 60 feet. The cable is attached to the counterbalance. The hydraulic elevator uses an oil-filled piston to elevate the cab. It is concealed behind a wall, staircase, or bookcase. The piston is pushed up by pressure generated by the hydraulic pump – similar to the tipper truck system (Residential Elevators, Inc.). The cab is lowered when the oil is released back to the reservoir through a controlled valve. The pump, oil reservoir, and control unit are located in a separate MR at the lowest level of the hoistway. A counterweight balances the load and lessens the workload on the machine. Heavy-duty tracks guide the elevator in a precise pathway and stop points. It has a high lifting capacity of four to eight persons, operates smoothly and quietly, and is loaded with features. The control is done from the cab’s COP or hallway station which are electrically operated. The cab can be accessorized with an intercom. It is also very safe from an accidental freefall because oil is viscous and passes through narrow pipes. The elevator costs between $15,000 and $25,000. Retrofitting it costs about $20,000, but installing in a new construction costs about $10,000. Installation on each extra floor costs an about $10,000 because of the extra materials and labor used. The cable or traction elevator is hoisted by cables that wind on a pulley driven by an electric motor. It is normally installed during a new construction and is suited to high rise and mid-rise buildings. 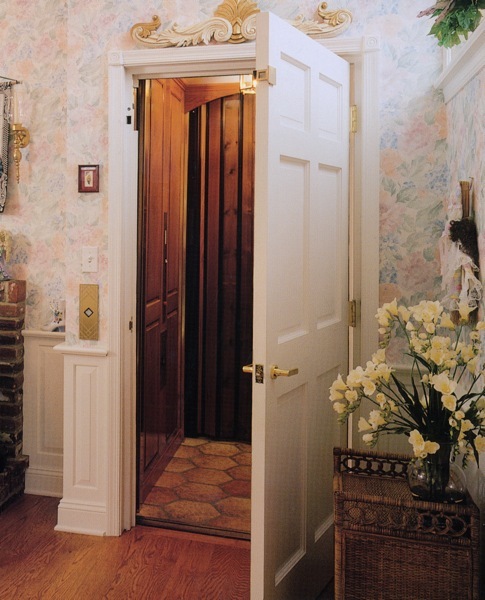 The residential traction elevator has a high load capacity of 600lbs to 1200lbs or four to eight persons and a speed of between 200 feet per minute and 2000 feet per minute. It is expensive to install, especially in a retrofitting, because of the amount of engineering work involved. According to ImproveNet.com, the total cost of installing in a new construction hovers around $25,000 to $45,000, while a retrofit goes up from $35,000 to as high as $60,000. Extending the traction elevator to another floor is tricky because the MR has to be relocated higher up, which can cost more than $20,000. The ultimate customization and décor cost can reach $100,000 (houzz.com). The motor is located the MR, above the hoistway. The cab moves along guiderails, and its weight is countered by a counterweight. The traction elevator has a control system, drive motor, gear or gearless system, and a speed governor. At the bottom are car and counterweight buffers. The geared traction has a gearbox for variable load and speed change. The gearless traction has the pulley attached directly to the motor. The speed is varied by increasing the power output. The gearless elevator can travel at up to 1000 feet per minute. The MRL traction elevator is a compact system with a compact but powerful motor drive that is either fitted in a small space at the top of the hoistway or attached to the cab’s rooftop. The load capacity is Type I or 750lbs to 1000lbs, although higher capacity cars are available. Generally, the elevator cost increases by $2,000 for each extra 100lbs of load. 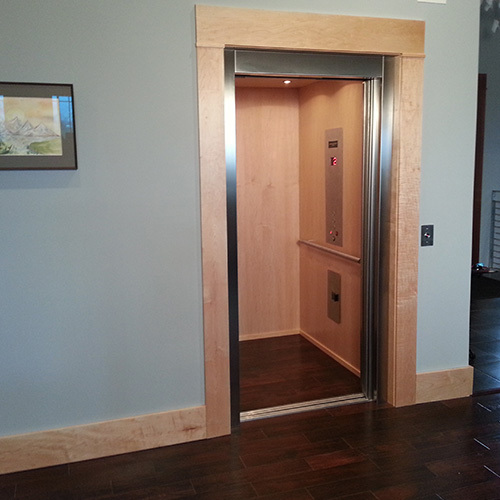 The residential elevator covers up to five floors and basement or 50 feet. It travels at 40 to 50 feet per minute, which is about 15 seconds per floor, and makes a total of six stops. However, most homes require only a two-floor elevator. The COP indicates the current floor, the direction of travel, and features press buttons for opening, closing, and indicating the destination floor. A simple COP has just an up-down flip switch that you release upon arrival at destination. The car lights automatically light when there is a passenger in the cab. Some cabs have a weighbridge to detect and warn when the cab is overloaded. Most residential elevators have an emergency power backup for continued use of the elevator, or a UPS for lowering the passengers to the next floor down. Small, rechargeable batteries are used for emergency lighting all around the cab. There is an intricate system to make emergency stops and apply safety brakes. The hydraulic drive system allows for a hydraulic lift arm, a submerged pump and motor, and two-speed control. The in-line drive system uses direct drive motor gears with variable frequency for smooth change of speed. Ideally, the elevator entryway is an accordion design, but it can adopt other less automated designs. An advanced elevator will feature an intercom and a 3 speed door sliding. Many companies offer a two-year equipment warranty, and a five-year service warranty. As a major undertaking, elevator installation involves an approved or appointed elevator engineer, interior designer or architect, electrician, and carpenter. Since it is designed to conform to universal design the elevator must be carefully positioned, for example along or at the end of the hallway, near the staircase landings, or as a bump on the external wall. If the hallways on two floors are not aligned to each other, then the elevator has to be at the corner of the two hallways (aerial view) requiring a two-door cab. Some elevators are designed with two doors for different access directions, for example they may have a front and back door, or front and side door. In a retrofit, the space for the elevator and landing is sometimes taken from the bedroom, closet, study, bar, dining room, or created on the exterior wall’s bump. The landing for the elevator on each floor should be at least 4 feet wide with 5 feet approach. In all the elevator does take up an appreciable space in the house. The building code limits residential elevators to a maximum of 18 square feet, which technically can fit up to eight persons or a patient’s bed. The elevator installation project is a major undertaking done by qualified elevator engineers or technicians, an interior designer or architect, electrician, and carpenter, following the principals of UD. It is ideal in the residential setting because it has a small footprint of less than 18 square feet, is operated effortlessly, and reaches all floors with ease. A wheelchair can roll-in and roll-out without transfer. The elevator improves the house resale value by 50 percent of the elevator investment. You need to cater for wheelchair maneuvers by having a wide hallway, landing and elevator entryway. The building code limits the size of a home elevator to 18 square feet, and you have to obtain a special permit to install it, which costs about $200. The designer or architect will identify a suitable site in the house for the elevator, usually near the staircase landing or next to the hallway. For a retrofit, a footprint is hived off from the atrium, bedroom, closet, or living room, or by bumping out on the exterior wall (which requires another special permit costing $200 or so). You will save space by siting the elevator at the end of the hallway, in the middle of the staircase, or at a corner room. In any case, the landing must be at least 4’ wide on each floor. You will decide on the capacity which ranges from 450lbs to over 1000lbs or two to six persons for residential elevators (houzz.com and NEII). Elevators are cheaper to install in a new construction, but significantly more expensive to retrofit in a remodeling project. You are allowed to make medical deduction if the elevator is for serious medical disability, but you still have to pay the annual inspection fee of $75 to $200. A shaft-less installation may be a simple process involving measuring the exact position for the elevator tube, cutting through the floor or ceiling above, and fitting the tube in the space. The holes in the floor will then be repaired and finished as before. For shaft elevators, the shaft has to be constructed, usually by an independent contractor. A hydraulic elevator requires more footprint, including a MR. The shaft will also need to be concealed behind some other feature with an 8” thick wall. The shaft base will have a 12” thick concrete foundation. If a MR is created, it will have a 30” access door and at least a 24” clearway to the machines. The entryways on each floor will be cut to the width of a standard door (32”) up to the width of a hallway (44”). After installation of the elevator, the entryway will be given a final finish. Next, the machines, electricity, and backup power will be installed in the MR by the supplier. The rail system will be installed and fastened to the shaft wall. Finally, the cab sling and cab will be fixed in their place and connected to the electricity. Before commissioning, the new elevator must be tested, inspected, and approved by the local building authorities at a fee of between $75 and $200. Elevators are built uniquely to each home using the house design and manufacturer components. Standard elevators are of two types, Type I which has a load capacity of between 700lbs. to 1700lbs. and a Type II which has a load capacity of between 1760lbs. and 3500lbs. The elevator cab has one or two doors which can open to one side or from the center. The counterweight can be located at the back of the cab or on one side. The main components of the elevator are the hoistway, cab, the machine and drive system, the control system, and the safety system. The hoistway or shaft is the straight, long, vertical passageway for the elevator. It not only is the elevator’s passageway, but also a protective barrier from interfering with the mechanisms and normal operations of the unit. It is built by a different contractor from the elevator company, and to exact size that will just fit a standard elevator. According to Residential Elevators, the internal shaft’s internal dimensions must be at least 4’4” by 4’7” after finishing. At most the residential unit must not exceed 28 square feet, allowing for a 3” gap around the car for the railing, finishing, and counterweight. The hoistway railing has notches for the braking system wedges. The entire hoistway is then finished with a protective wall around it. Sometimes the wall is installed by the elevator company, such as Stiltz, as part of the elevator design. One of the most important aspects of the hoistway is the entryways on each floor. The entryways need a protective barrier to prevent one walking into an empty space, especially children. They also prevent operating the elevator unsafely. The hoistway barrier or gate or door works in tandem with the cab car so that it only opens when the cab stops at that floor. Some gates have a key that is used alongside the hallway station to ensure security and that only authorized persons use the elevator. The hoistway gate styles include a swing, scissor, sliding, or accordion style. Most residential elevators have a conventional swing door for the hoistway, which is not only easier to install, but also comes in different designs that complement the rest of the hallway, adjacent staircase, or room. Designs include solid wood, wood veneer, vinyl, fiberglass, glass, or steel, depending on personal taste, budget, and the surrounding décor (see our article on Cost Guide on Entryway Door). The door is often installed by the carpenter at a cost of between $450 and $1,500. Some hoistway door panels are made of a transparent material such as glass or plastic, especially in case there is a special care user in the house who needs constant monitoring. The scissor style is also common because of its practicality, small footprint, and low cost, but it has less appealing looks. It operates rather loudly by rolling on casters and the manual version takes an effort to open, which makes it unsuitable for UD. It is a see-through gate that allows you to see the arrival of the cab, but it is also rather unsafe for children. The scissor hoistway door is made of stainless steel or aluminum and costs about $350 to install. It requires a higher level of maintenance because of lubricating the many moving parts. The accordion style is functional, uses a small footprint, and has elegant style. The door is made of stainless steel and works by retracting and s into or emerges from the “belly” of the outer panel. It operates automatically and is the most expensive option at around $700 and $2,000. It normally has infrared sensors attached to it to detect motion and an approach, and therefore keep the door open. The sliding door is not commonly used for the gate because it extends beyond the footprint of the elevator. However, it can be used where the door can be slid along the hallway wall where it would not cause inconvenience. The sliding door is finished with solid wood, wood veneer, steel, glass, fiberglass, or vinyl. A sliding gate costs about $500 to $1200 to install, and it requires frequent maintenance of the sliding rails. The elevator normally has a combination entryway where the inner (cab) door slides or rolls on rails, while the outer (hallway) door can either slide or swing on a different operating system. However, where the accordion style is used it is applied to both doors as an integrated operating system. Generally, solid wood doors offers the most elegant designs, but they are expensive to install. The hoistway door can be a French door. The elevator travels on vertical rails which are attached to the walls of the hoistway. The rails are heavy and sturdy steel bars which also act as the support frame for the entire elevator system. They must be able to support the weight of the elevator and withstand the extreme forces when the elevator gravitates downwards rapidly or hoists a heavy load. They have notches for holding brake wedges during an emergency stop. The rails are made to be smooth for sliding but with a good grip for braking. The car sling is a sturdy, flat steel frame that is attached to the hoist mechanism and the counterweight. It forms the foundation on which the cabin unit is built. It also hosts the brake system, the contacts with the railing, the protective steel plate that impacts with the car buffer, and most of the safety gear. The cab, aka car or cabin, is a cubicle in which the passengers and goods are transported to different floors. It is built of a steel frame and panels of steel, wood, vinyl, or glass and suspended on a cable. The cab is built on a frame, upper transom, and lower transom. The inner dimensions of the cab are given as car width or CW, car height or CH, and car depth or CD. The CH is the space between the faux ceiling and the baseboard, the CW is measured from side to side, and the CD is measured from the door to the backside. The frame height is adjustable to accommodate the specific hoistway CH. It has attachments for the mechanical accessories for the rail guide shoes, brakes, and safety system. The upper transom accommodates the door operation system, while the lower transom carries the cabin and door safety gear. The cab may have one or two doorways. Apart from the normal front door cab, there is the open-through cab with a front and a back door, and the diagonal cab with a front and side door. The landing gate protects users from walking into an empty hoistway space. The gate only opens if the cab has stopped at the floor. The cab floor is made of a baseboard that is finished with hardwood, metal panels, vinyl, ceramic, PVC, or melamine. The baseboard has a load sensor that indicates and warns when the cab is overloaded or the load is imbalanced. The elevator door remains open until the load is set right and load reduced. Having a small-sized cab helps to keep the load small. You can calculate the passenger capacity by dividing the rated load capacity by the average weight of a person (165lbs or 75kg). The lower part of the floor is made of a reinforced steel plate for impact in case of a free fall bang into the car buffer. The cab interior is finished stylishly with wood, steel, ceramic, hardwood veneer, laminate, or vinyl panels, which may be painted or varnished. The handrails can be metallic or wooden, and flat or cylindrical shapes. You may want to install extra handrails at a cost of $60 to $120 apiece. The COP is located on the side panels and contains all the functionalities of the can. The kick plate protects the finishing on the lower part of the wall from human kicks or scratches from rough loads. The doorway apron prevents tripping or catching the toes in the gap between the can and the shaft wall. The faux ceiling contains the ventilation, ventilation fan, recessed lighting, and escape hatch. The elevator uses energy-efficient fluorescent tubes or LED lamps, which can be modified into recessed lights at a cost of $450. A small fan and ventilation louvres help to keep the cab cool, well aerated, not humid, fresh, and free of mold and mildew formation. Electrical switches at the escape hatch, which can only be reset manually, shut down the elevator operations to prevent it restarting during an escape from the cab. The hatch measures 24” by 18” and has just enough room for a person to squeeze through. The cab can be factory customized at an additional cost of about $2,500, or by a designer for about $4,000. The cabin’s rooftop is surrounded by a safety balustrade. There is a manual lever for opening the escape hatch. Infrared lights are a non-intrusive safety feature that sense movement across the doorway and activate the door operating mechanism. Furthermore, a sensor and mechanism positions the car floor at the same level as the landing for unobstructed entry or exit, especially when using a wheelchair or walker. Other safety and emergency measures include illumination of the COP buttons, a digital display of the floor position and direction of movement. The car operating panel or COP is the user interface found in the cab for the control of the elevator. It gives options for direction, choosing the floor to go to, switching on the lights, ventilation fan, and music, open and close the door, emergency call intercom, panic button to stop the elevator and ring the alarm, and so forth. The hall station is the user interface on the outside of the elevator, which is found at the landing, next to the door. It may have a key to activate the elevator, thus making it safer and private, or it may be key-less. It has buttons to indicate you want to go up or down, and a display of the position and direction of movement of the elevator. The hall station is located on each floor the elevator stops. The COP and hall station are usually finished in a polished metal. The elevator entrance is made up of the cab door working in tandem with the hoistway gate on each floor. The contact face of the cab door has infrared sensors to detect movement through the entrance, and it stops and reopens the doors. The elevator cannot move until the two doors are shut properly. The doors are operated either manually or automatically. The manual doors are quite basic and inexpensive, and they require that when you enter the elevator you close the hoistway door first, followed by the cab door. The automatic doors are operated by either a hydraulic or electric system. They are more expensive but convenient to use. The cab door comes in three styles, namely; scissor, sliding or accordion style. The scissor style is made of a diagonal mesh of steel bars connected to each other at pivot points. The guide rails makes door operation smooth. The design is very economical on space. Its see-through mesh makes the cab less private and therefore often used with a solid panel hoistway door. It is also the least expensive and least appealing of all the elevator door styles. The manually operated scissor door takes an effort to operate. The sliding door style is made of solid panels of wood, glass, steel, or vinyl running on rails. It has an appealing style which raises the cost of the cab by between $200 and $1,200. The accordion style door is similar to the sliding door except that it has several narrower panels that recede into each other and therefore save on space. The system is normally hydraulically operated. It adds an extra $550 to $1,800 to the cab cost over the scissor style. The car buffer is a hydraulic piston at the bottom of hoistway pit which acts as shock absorber when the car hits the bottom hard. The fluid inside the piston flows out slowly thus cushioning the car stoppage, especially in an emergency. The counterweight buffer acts the same as the car buffer when the counterweight hits the hoistway floor. Elevator installation from shaft construction till the final touches takes about 10 to 15 days. Because of limited space, most installation work is done by one or two people. The important stages in elevator installation are shown in the table below. Remodel Permit $200 - 1 hour Ensure structural integrity of house and elevator. Build Hoistway $5,000-$8,500 $3,500 3 days Create elevator passageway. Purchase Elevator $10,000-20,000 $500 3 hours Choose appropriate design and style. Build Machine Room $1,500 $1,500 1 day Housing the motor and drive mechanism. Erect Elevator $600-$1,500 $2,000 6-10 hours Connect cab, drive, cables, brakes, rail guides, and safety system. Electrical Finishing $3,000-$35,000? 4 hours Connect COP, hall stations, lights, and fan. Carpentry Finishing $500-$2,000? 8 hours Finish walls, ceiling, landing, and floorboards. Finish Landing and Cab $1,500-$6,000 5 hours Finish with appropriate materials, paint, and d?cor. Clear and dispose Debris $50-$100 $100-$200 1-2 hours Local disposal fee, transport. Initial Test and Inspection $1,500-$8,000 1 hour UD to aid wheelchair. Maintenance/Repair $50-$1,500 $100-$750 2 hours Periodic Oil change, cable change. Annual Inspection $80 1 hour Check elevator safety, especially brake system. Install Intercom $100-$250 2 hours Call for assistance. Install Motion Sensor Lights $100-$250 $200 2 hours Automatic switching on of lights in the cab and landing. Many users are unaware of the proper way to use, maintain, and be safe with the elevator. Safe as it may look, the elevator can be a dangerous place. Children like to play with it, the aged and disabled are too frail and slow to react to situations, and the door sensors can fail to detect and react to motion, power may fail, and in the worst case scenario, the sling cable may snap. These mishaps result in an emergency. Because it is difficult to handle elevator emergencies, the elevator companies have incorporated many safety measures. Home Safety Awareness For Elevators or HomeSAFE have partnered with Garaventalift, Inc. in a campaign to educate users on elevator safety and proper usage (homesafecampaign.com). Others include the Accessibility Equipment Manufacturers Association or AEMA, National Association of Elevator Contractors or NAEC, National Association of Elevator Safety Authorities International or NAESA, and National Association of Home Builders or NAHB. FederalElevators.com describes the common safety features on their elevators. An emergency battery backup ensures continued service even after power fails. A UPS ensure safe lowering to the next floor and opening the doors for exiting. The emergency lighting lights up the cab interior during a power failure. Other emergency lighting at the landing ensure one walks safety away from the stalled elevator. An alarm button on the COP alerts people outside the cab of the emergency situation. An intercom or telephone extension allows communication with people outside about the emergency. The door interlocks prevent accidental fall into the hoistway space, or unsafe operation of the cab. The entryway doors can only be operated when both cab and landing doors are properly aligned to each other. A leveling device ensures the car is safely aligned to within a half an inch of the landing. A cab apron ensures one does not trip when passing through the elevator entrance. The final limit switch, located at and activated by the emergency escape door, is a last result emergency switch that cuts off all power to the elevator in order to allow safe evacuation. The switch can only be reset manually. A telephone extension to the landline allows one to communicate directly with 911 or other emergency response team, especially when there is no response after the alarm button is pressed. A curtain of infrared beams is used on accordion doors to detect movement and keep the doors open for safe passage. Contact switches on the elevator door and gate ensure the car does not move until they are properly closed. The slack or broken cable device is an extra cable to support the weight of the loaded in case the main cable becomes loose or snaps. A flow control valve acts as speed governor between floors by controlling the flow of hydraulic or brake fluid. The elevator guide rail system is built of sturdy steel bars held against the wall by brackets. This ensures the elevator can take the full weight of the elevator, overhead drive system, and the loaded cab. The instant braking system, which is activated by the speed governor, grips the guide rails when there is an emergency. The governor uses the centrifugal principal in which fast rotation pushes the flywheel outwards, which in turn pushes the braking mechanism. The safety brakes clamp onto the rails to stop the cab at the landing. If the cab is in a free fall then brake wedges will snap into the rail notches to cause an abrupt stop. As the elevator lowers it compresses the air beneath it and forms a soft air cushion to slow it down. Friction with the rails will also reduce the cab’s speed. On impact, the cab will hit the car buffer. If you are in a free-falling elevator, then you should lie low on the floor to reduce bodily injury. For extra safety, most residential elevators have up to four safety cables, each capable of holding up the weight of the loaded car. They also have sensors to detect a broken cable. Regular inspection after installation ensures all the cables are in working order. A sturdy cantilevered sling can hold up to 1,000lbs. A sensor system detects when the oil level is low and when the oil is used and needs replacement in a hydraulic elevator. Some elevators have a pressure gauge to determine if there is an oil leak that is reducing the hydraulic lifting force. According to EITA, magnetic brakes hold the car onto the rails when the motor stops. The controller system is a circuit breaker that protects the electrical components from too much current and voltage surge. A set of safety gear is installed to grasp the rails firmly, including the car brakes, magnetic brakes, and the floor stop wedges. The buffer is a hydraulic shock absorber that acts as a cushion against heavy landing or sudden stop. It uses an oil-filled piston since oil is viscous and flows more slowly. The cab buffer cushions the cab, while the counterweight buffer cushions the counterweight. Cable elevators are extremely reliable, unlike the depiction in fiction movies. For extra safety, the pulley system has three or four sets of cables on different grooves, each capable of supporting the cab load. The counterweight is also attached to cables. The cables are replaced every five years if they do not snap in between. If all the cables snapped (unlikely though), then the car sensor systems will cause the brake wedges at each floor to lock. When the car travels too fast, for example in a free fall, then the centrifugal-activated speed governor activates the brake system to slow down the car. If it spirals out of control then the speed governor cuts off the motor power, and clasps the safety rope. Handrails in the cab and at the landing support weak and disabled passengers, especially if the cab vibrates. The handrails are made of either wood or polished stainless steel. The cab is manufactured with a single handrail, but you can purchase more handrails at a cost of $50 to $120 each. The door safety feature that senses movement past the door and therefore keeps it open until the person or object has entered the cab is the door sensor. If the obstruction does not unblock the doorway, the system will go into a nudge mode in which the door will slowly close while giving a continuous warning beep. A stylish way to the door operation is the use of color-coded LED lights where green is for opening, red is for closing, and flashing red is the nudge mode. The cost of adding advanced sensors is in the range of $350 to $600. The door sensors use a separate battery-operated which costs about $80. An infrared beam transmitter unit called the TX unit and a receiver unit called the RX unit cost about $250. There are different types of sensor. The normal door sensor is installed on the cab door only. The mixed bumper and sensor unit is a bumper unit with a built in photoelectric sensor. The electric eye or photo eye is a pair of infrared sensors at knee level that scan the doorway. A safety ray is a pair of infrared than scan the entire doorway. The 3D multi-beam door sensors scan the doorway and hallway continuously and at full height. The ultrasonic sensor, which is not yet in widespread use, scans a full-height 3D area using echo sound. Some of the well-known names in door sensor manufacture are Telco, TL Jones, AA Electric, Memco, and Weco. Since the elevator is mostly closed and has poor air flow, a ceiling fan and ventilation louvres are installed. The ventilation fan removes humidity, bad odor, and excess heat from the cab and makes it more comfortable to ride in. CCTV is not crucial in residential elevators since there is little traffic. The camera in mounted on the higher sections of the cab walls or on the ceiling. The CCTV deters naughty people from vandalizing the cab. The unit costs about $650. The machine room should only be accessed by the home owner and the service technician/engineer when doing inspection (Garaventa Lift). The MR should be well-lit and not barred with a deadbolt. The doorway should be less than 30” wide. If it is a shared room, then when doing chores like emptying the trash receptacle, changing a bulb, or inspecting the fire extinguisher, or when the technician is doing inspection and repair, then post an “Out of Service” notice on all the elevator doors. Clean up the area after maintenance. Like all elevator manufacturers, Garaventa Lift, manufacturers of Elvoron brand of home elevators, state that they use materials of the highest standards for long-term reliability, safety, style, and comfort in the manufacture of the drive and control mechanisms of their elevators. The John Brown University has issued guidelines for safe use of the elevator. The elevator must not be overloaded as this could cause the cable to snap or the drive motor to fail. Do not exit or enter a moving elevator, wait until it has completely stopped. Do not pry the door open. Call for help using the intercom or a mobile phone when you are stranded in an elevator, do not attempt to climb out of the elevator without clearance from a rescue personnel. If the building is on fire do not escape through the elevator, as the fire may cause the power supply to disconnect. Make sure the cab floor is at the same level as the landing. Do not manually operate the doors if they are designed as automatic ones. A reliable and safe elevator should have a manual lowering system in case of emergency and a cab rooftop escape hatch that is used after disabling all power supply. The emergency lowering kit includes a UPS to supply enough power to lower the car to the next landing and open the door for occupants to exit and a battery backup to continue elevator operations after a power outage. Delta Elevators of Canada supplies a backup battery unit at USD 780 and a UPS at USD 250. A full kit for a MRL drive system costs USD 950. The backup battery costs USD 210, while the COP, lighting and fan emergency battery costs USD 40. Customization includes design, features, the car, the COP, the landing, and décor to create an elegant, comfortable, and safe transport feature in the house. The design allows for a one-door or two-door design, with the second door at the back or side, depending on the alignment of the landing on each floor. A customized cab door and hoistway gate costs approximately $750 to $1,800 and $500 to $1,200 respectively. The car frame is a steel structure with an adjustable height from 6’7” to 8’0” to accommodate a specific installation. An emergency button, intercom and telephone extension are fitted for emergency communication. An automated accordion entryway with a “curtain” of infrared beams that trigger automatic door opening is preferred for wheelchair users and the frail. Extra handrails at different heights ensure all user needs are accommodated. The cab and landing can be fitted with a music system that is controlled from the COP. A keyed COP enhances safety by restricting the elevator operators. The hydraulic system’s MR can be located away from the elevator in order to safe space, minimize noise, and eliminate hydraulic oil smell and leaks. 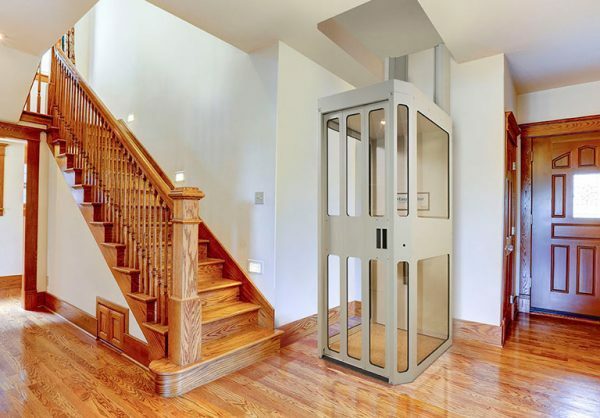 Delta Elevators observes that home owners appreciate the comfort and value of an attractive elevator cab, and visitors and potential home buyers will be impressed if it is well finished. There are many options and finishing available from cab manufacturers and which would match the general house décor. An example of cab interior basic options, such as Delta Elevators’ standard elevator, includes a stainless steel framework, recessed and bright lights, rustproof handrails, a COP with quality, well-polished metallic finish and backlit buttons, an illuminated elevator direction and floor indicators. The rear and front returns have raised plastic laminate panels, the floor has a strong material that is easy to clean. For example tiles and wood, or metal, and the base and reveal can be finished with a sturdy and attractive enamel. These features are sold as part of the cab price. Optional features include a stainless steel trim on the plastic laminate panel, mirrors on the walls, cushioned flooring, a steel base and reveal, a steel car door, and a ceiling-mounted and adjustable speed fan. These extras cost around $3,200. A custom finish can cost up to $20,000 extra because it features premium materials and workmanship. It features stainless steel handrails around the wall, finishes with fine materials such as high-grade, brushed brass handrails, wood paneling with large mirrors in the walls. A music system pipes music into the cab, while a chime announces arrival at destination. Emergency features include a battery-powered lowering unit, intercom connection, and a security camera. The elevator ceiling has aluminum louvres, T-bar, recessed lights, and polished, stainless steel panels which enable LED lights to flood the lights and are durable. LED lights are energy efficient. The ceiling also has ventilation and an optional ventilation fan. The National Elevator Industry, Inc. has led in various innovations and sustainable technologies in elevator manufacture, especially in the areas of safety, MRL, drive systems, and energy efficiency within the building industry and specifically in-building transport systems. Billions of people use the vertical transport in the cities and homes around the world every day. The most significant new technologies are MRL and regenerative drive technology. Advanced technology has enabled creation of compact yet powerful drive units which can fit in the hoistway, that is; the cab bottom, the cab top, and the top or bottom of the hoistway. There is no need for a separated machine room. Furthermore, the technology saves between 50 and 80 percent on energy costs compared to common traction and hydraulic elevators. The permanent magnet motors of the MRL is smooth to ride and requires less ventilation, lighting, and lubrication needs associated with MR. Although the MRL elevator unit itself is slightly more expensive than the conventional system, the overall cost of installing the MRL is about 15 percent less. This is an energy efficient drive system that converts unused energy into electricity for other uses. For example when descending, the system becomes a gravity-driven generator with the extra power being used to drive the households HVAC or water heating system. The excess lift power when a light load ascends can also be converted back to electricity. The overall saving on power can be as much as 70 percent. Modern innovation emphasizes environmental sustainability and responsibility, with an aim to achieve a net-zero energy buildings, that is, building that produce as much energy as they consume. These are achieved by the use of energy-efficient dispatch systems, compact and regenerative drives, efficient hoist mechanisms, and modern suspensions. Modern building codes encourage efficient, responsible, and sustainable technologies. In the US and Canada, the Energy Standard for Buildings Except Low-Rise Residential (ASHRAE 90.1) and National Energy Code of Canada for Buildings (NECB) have become the standards for elevator manufacture and installation. Motor rooms occupy extra footprint in the house and require even more footprint for the approach and landing. Modern designs have come up with machine room-less or MRL systems that have compact yet powerful drive and control systems that can be mounted on the cab itself, at the ceiling of the top elevator floor, or in a tacked away space for the hydraulic system. MRL utilize electronic features and are more appealing in design. COP – Car Operating Panel is the unit in the elevator car where you communicate with the elevator, for example to give direction and floor, or to pipe in music, and so on. CW – Car Width is the distance across from one side to the other of the cab. Door Sensor – An infrared beam at the elevator entrance that activates a switch to keep the door open when an obstacle is crossing the doorway. It goes by other names like door detector, electric door man, photoelectric cell, infrared beam, electric proximity edge, or safety door edge. Hallway Station – the control panel at the landing where you instruct the elevator to open the door and indicate the floor you want to go to. HVAC – Heating, Ventilation, and Air Conditioning is the indoor system that controls the temperature, air circulation, and humidity in the house. LED Light – Light Emitting Diode is a very efficient light producing diode which is activated by a low electric power. It converts 95 percent of the energy into white light and only 5 percent is wasted as heat. It is produces 300 lumens of light per watt compared to incandescent bulbs that produce less than 40 lumens per watt. MR – Machin Room is the housing for the lift engines or mechanisms, for example the hydraulic pump room at the base or the traction cable motor unit above the last floor up. MRL – Motor Room-Less is a modern elevator concept that has no separate room for the mechanism to operate. This is achieved by having compact machine parts that are still very strong. Speed Governor – this is a device that operates on the principal of centrifugal force to apply safety brakes when the governor spins too fast. UPS – Uninterruptible Power Supply is a battery unit that automatically supplies AC power for a while when there is an outage of the mains supply. UD – Universal Design is the concept of making a one-fits-all design for both the abled and disabled persons, for example an elevator can be used by all house occupants unlike stairs that are for the abled only or the chair lift that is for the disabled only.